As a school it is our responsibility to foster a love for lifelong learning skills among all of the school community. As the use of technology is becoming an everyday necessity, computing is a crucial part of the school curriculum. Computing and communication technologies are an important tool through which many personal skills can be taught, such as staying safe, responsibility for our actions and agreeing to and following rules. Our pupils and teachers try to use technology in a cross-curricular way and to teach other aspects of the curriculum. In Reception, children use their growing awareness of technology to explore familiar items such as remote controls and phones in the home corner. We use an interactive touch screen and iPads to make the most of their current skills to access games and software to enhance their learning. The desktop computers in the classroom give the children a different experience when learning, and introduces the need for usernames and passwords. KS1 children build on the devices they have used in Reception, and start to learn simple computer related skills such as typing in MS Word and recognising some of the common icons. The use of roamers and robots gives them the opportunity to explore early coding, and the need to give accurate, precise instructions. Years 3 & 4 learn more about vocabulary such as algorithm, code and computational thinking. As well as using their previous iPad knowledge, they also begin to use ‘drag and drop’ coding software to give basic instructions to characters onscreen. Their multimedia skills begin to increase by using more of the detailed features of Word & PowerPoint, such as fonts, inserting & resizing images, and spelling tools. There is also more emphasis on transferable skills, such as drawing tools. We also introduce animation skills during these year groups. In Years 5 & 6 pupils really begin to get to grips with the language of ‘drag & drop’ coding, and further develop their understanding of the need for precise instructions. Using Scratch they make their own characters (sprites) and backgrounds, and create programmes for them to move and come to life. When creating multimedia presentations, the emphasis now falls strongly on the appropriateness for the target audience. Reception children are introduced to online safety by thinking about why we need to ask adults for permission to use technology, and why we must ask for help when we are stuck. KS1 pupils start to develop an understanding of the need for password security, and what sorts of things could go wrong on the internet. We use Digi Duck to support our KS1 teaching and to help children understand how to keep themselves safe online. 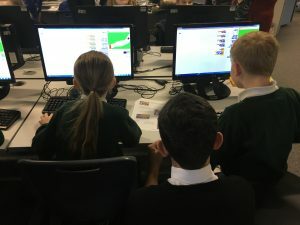 In Year 3, pupils are introduced to some of the security dangers, such as phishing emails, which they may start to see as their online presence grows. During this year we being more work on the safety of social media sites, and why they still need adult guidance on settings. Year 4 pupils are the first year group to create (& remember!) their own passwords for using the school systems. They are taught how to make passwords which are both secure and memorable. Years 5 & 6 focus a lot on the safe and responsible use of social media, including the ambiguity of text messages and emails. The overall aim is that pupils leave Hutton with the ability to not only keep themselves safe, but to use the internet with respect and integrity.